Everything about Lido di Jesolo near Venice. Day trips to Venice from Lido di Jesolo. Tips for staying overnight. Lido di Jesolo is a modern place. There are many new buildings and skyscrapers. The tourism is gigantic. Actually, the place is a suburb of the city of Jesolo, which lies a few kilometers inland. But in the meantime the suburb is much better known than the city itself. There are hundreds of hotels and restaurants along the beach towards Cavallino. Cavallino is similar in size to Jesolo. Together it is one of the largest holiday areas in Europe. In Italy at most Rimini can compete with Jesolo / Cavallino a few hundred kilometres south. Every summer 4 to 6 million tourists come to Jesolo, plus several million to Cavallino. In winter there is not much going on in the beach resort. 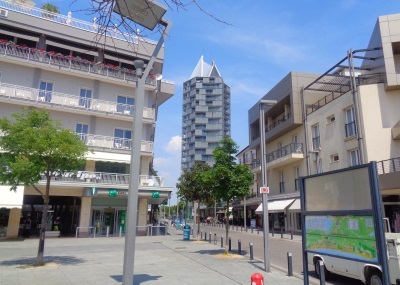 The centre of Lido di Jesolo is also modern. The whole town seems to have been built in the last decades. There are no old buildings or an old town. 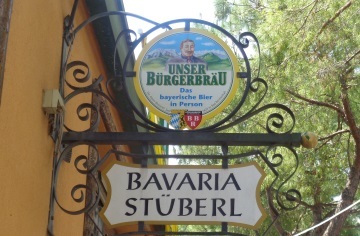 Many tourists come from Germany, there are even German pubs in Lido di Jesolo. The beer is partly served, as in Bavaria, in beer mugs (1 litre). The biggest attraction in Lido di Jesolo is undoubtedly the beach. The wide, 15 km long beach is one of the longest beaches in Italy. You can pay without entrance to the beach. Lying-beds and sunbeds are, as often in northern Italy expensive (over 20 euros for 2 people per day). 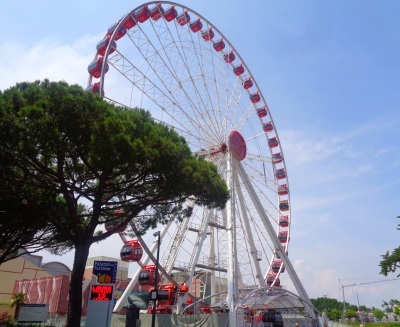 Another attraction is the 60-metre "The Wheel of Venice", not far from the centre of Lido di Jesolo. The Whell has a similar height as the legendary Giant Wheel Vienna. Other attractions in the tourist town near Venice include the large water park Aqualandia and the modern, large aquarium Sea Life. Shopping Lido di Jesolo: The most important shopping street is Via Andrea Bafile, which is many kilometres long. This street runs parallel to the beach. There are many hotels in Jesolo and of course we don't know all of them. In the following we would like to recommend some hotels that we know ourselves and that we liked. Very nice we found the Hotel Lido in the center of Lido di Jesolo almost directly on the beach. The hotel has a private section on the beach, deckchairs and parasols are free for hotel guests. For a single room in September and October I paid less than 40 Euro, a delicious breakfast is included. The nice lady at the reception speaks excellent German. The bus to the ferry to Venice is only a 2 to 3 minute walk from Hotel Lido. More information about the Hotel Lido in Jesolo. Just outside the city centre in the direction of Cavallino are 2 more of our favourites. The often very cheap Hotel Ute (more info) and the Hotel Palme (more info). Both are close to the famous water park Aqualandia and almost directly on the golden beach of Lido di Jesolo. As far as we know, a good breakfast is included in the price of both hotels. The 3 hotels are accommodations, which have a good price/performance ratio and cost outside of the high season clearly under 50 euros. Of course there are many luxury accommodations in Lido di Jesolo. In our opinion, the best overview of hotels and pensions in Jesolo with booking facilities can be found on Booking.com. Very popular in the Jesolo / Cavallino region is also camping. In the area are some of the largest campsites in Italy. Staying overnight in Jesolo and day trips to Venice a good idea? Some Venice tourists spend the night in Jesolo. One reason is the low price of accommodation in Jesolo during the off-season. 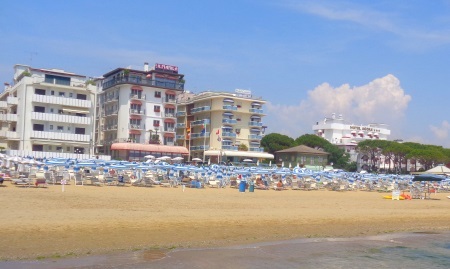 While it is often difficult to find a room in Jesolo for less than 100 Euros in midsummer, in winter the prices drop to sometimes less than 40 Euros. The offer of hotels is high, but outside the season (about mid-May to mid-October) there are hardly any tourists. In Venice, the season is much longer with correspondingly higher prices. In Venice is from carnival (February / March) until at least the end of October season. A disadvantage is the rather long trip to Venice. One is in the morning to Venice and in the evening back to Jesolo in each case a good hour on the way. A part of the money saved during the overnight stay is spent again for bus and ferry. In our opinion, the overnight stay in Lido di Jesolo is only worthwhile if one does not want to make an excursion to Venice every day of the holiday. How do I get by bus / ferry from Lido di Jesolo to Venice? Since parking in Venice is very expensive (20 to 30 Euro per day), it is recommended to use public transport. There are 2 ways to get from Lido di Jesolo to Venice. You can take the bus to Punta Sabbioni and then the ferry to Venice. The alternative is a rather long, direct bus ride via the airport and Mestre to the old town of Venice. Bus and ferry (our recommendation): The buses to Cavallino leave every 30 minutes during the day and stop at many stops behind the beach of Jesolo (bus line 23a). Many hotels are only a few hundred meters from the nearest bus stop. The buses Lido di Jesolo - Cavallino - Punta Sabbioni have a direct connection to the big water buses (ferries) to Venice. Travel times: The bus takes about half an hour, the ferry about half an hour. Bus only: The buses depart from the new, modern bus station of Lido di Jesolo about once per hour (a little bit irregular) to the bus station in the old town of Venice (Piazzale Roma). On the way they stop among other things in the city Jesolo, at the airport Venice Marco Polo and in Mestre at the station. Tickets for the buses: The fares are quite reasonable for the buses. Tickets are not available on the bus. You have to buy them beforehand. There are tickets at the bus stations in Lido die Jesolo, Punta Sabbioni and in Venice. If you get on the bus at a small bus stop, you can buy the bus tickets in any tobacco shop. Of course, there are also private operators who offer excursions by boat from Lido di Jesolo. A very popular tour goes to Venice and the two islands Murano and Burano. The day trip lasts about 11 hours. You will be picked up at the hotel in Lido di Jesolo in the morning and brought back in the evening, it couldn't be easier. More information about this day trip from Jesolo to Venice including online tickets can be found on the Website Getyourguide. There are frequent bus connections between Venezia Marco Polo Airport and Lido di Jesolo bus station. In high season the buses run several times an hour. If you take the half-hourly bus line 23a from Jesolo to the port of Punta Sabbioni in the south of the peninsula Litorale del Cavallino, you can also take direct ferries to other popular islands. These include the island of the glassblowers Murano, the island of the lace Burano and the small island Torcello. But be careful; these public passenger ferries only run once an hour, so only every second bus of the line 23a of Lido di Jesolo has a direct ferry connection. If you are not afraid of the high parking fees of Venice, you can also drive directly to Venice with your own car or rental car. The central city of the region Venice is of course well signposted, driving time about 45 minutes. Those who know a bit can also park their car on the mainland in Mestre or Marghera and go the last kilometres to Venice by tram or bus.